A white Nissan van has overstayed its welcome on the 500 block of Locust Street, next to Locust Street Park. Sources tell Columbia Spy that the van has been in the same parking space for at least a month. Street sweeping tickets are routinely removed by - someone. 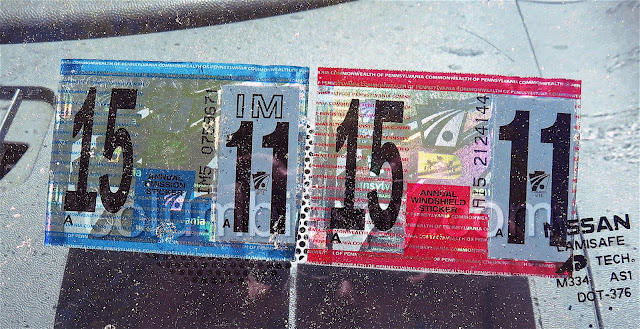 The van's PA state inspection and emission inspection stickers expired at the end of November 2015. 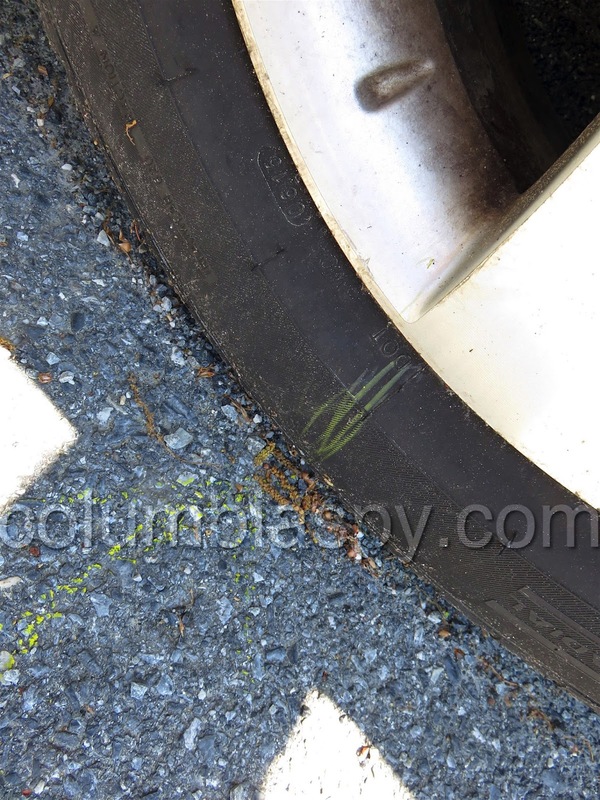 Witnesses report that about two weeks ago, Columbia Borough Police marked the front driver's side tire, shown above. It appears as though the vehicle has not been moved recently. Columbia Borough has an ordinance regulating abandoned vehicles. It's time for this one to go. This cannot legally be moved or should I say driven, it will have to be towed. Isn't there a code regarding vehicles parked on the street, they must have valid registration? Not even a boot on this one. yes I agree. 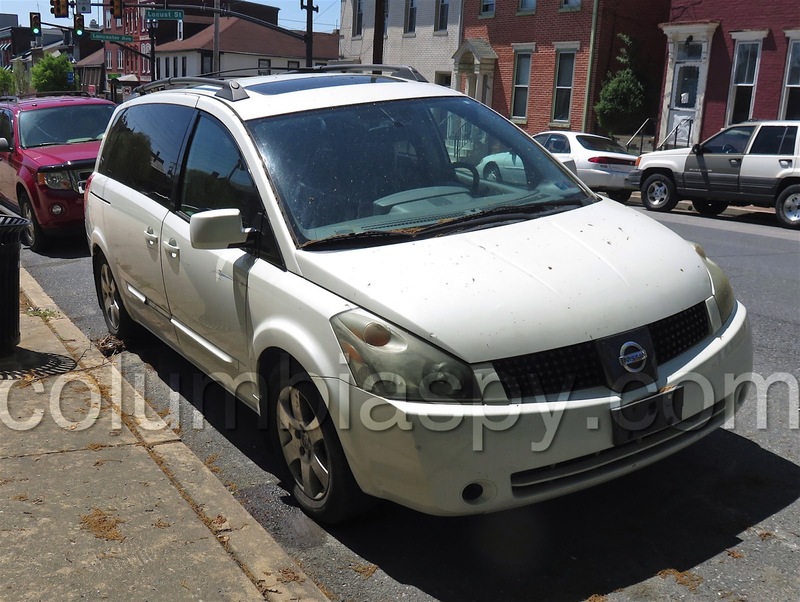 This van license #JSF 5925 PA has been abandoned since the end of March. well over the 48 hours. it is somewhere around 720 hours or more. this ordinance under Chapter 207-16 clearly states the 48 hours. Maybe is a relative of a police officer or the chief of Police. This was called in about two weeks ago but clearly ignore by our police. It has nothing to do with being a Columbian please it's the law move it. You must not be from Columbia because we are proud! The law is the law. It is not bent for everyone's personal need or excuse. If I forget to move my car one time, I'm nailed instantly. The "Columbia Way" is to bend the laws for your buddies. Columbia proud attitude would be MOVE it. Outdated vehicle registration. Parking is tight on that block, so now it's OK to turn it into a garage. Run the tags, if it comes up as a Columbia resident go to the residence and let the person know they have 48 hours to move the vehicle. If it isn't moved then tow it. That way at least the owner has a warning. All the police in this town and for what! Move this vehicle and lets see who owes all these tickets! I agree with Jimbo. Also was it checked to see if it was a stolen vehicle. Could be someone stole it and parked in there. This van is not there anymore! No one knows the next person problem...lol It will be back..
Off topic but Why does one sticker have "IM" above the month and not the other sticker? Anyone know? Thanks.